A case study illustrating arriving in an ancient city, Venice, as well as modern examples of this from Gardemoen Airport, Oslo; TGV Stations, Avignon, Valence, Aix; Chep Lap Kok, Hong Kong; and more. A case study illustrating enjoying an ancient city with modern examples of this classic response to the needs of a city. These include Marbella Old Town; South Bank, Brisbane; Copenhagen City Centre; and more. A case study illustrating moving around an ancient city and modern examples of this from Greenways, Edinburgh; Street Car/MAX, Portland, Oregon; Ultra, Cardiff; and more. 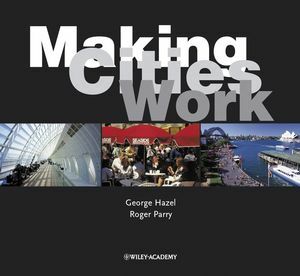 In addition, the book identifies "urban heroes," those individuals who have led particularly successful projects in urban improvement throughout the world. Order your copy of this practical work today. GEORGE HAZEL is Visiting Professor of Transport Policy at the Robert Gordon University, Aberdeen and Director of McLean Hazel, a consultancy specialising in providing transport advice, concepts and solutions for the public and private sectors. ROGER PARRY is Chief Executive of Clear Channel International, the global media company. He is the author of People Businesses (1991) and Enterprise: The Leadership Role (2003). BRIAN M EVANS is Artistic Professor of Urban Design at the School of Architecture at Chalmers University in Gothenburg and is a partner of Gillespies, an urban and landscape design practice. JAMES CRAVEN is Communications Director of Clear Channel International. He is author of numerous works on the marketing of public transport. VENICE – THE CLASSIC CASE STUDY. The New TGV Méditerranée Stations, France. Chep Lap Kok Airport, Hong Kong. Translink Interchange, Bangor/Belfast, Northern Ireland. Nils Ericson Bus Station, Gothenburg, Sweden. The South Bank, Brisbane, Australia. Copenhagen Squares and Spaces, Denmark. Faneuil Hall Marketplace, Boston, USA. New Rondas, New Ramblas, Barcelona, Spain. Circular Quay and The Rocks, Sydney, Australia. Post Office Park, Boston, USA. Bristol – The Legible City, England. Cycling in Rennes, France and Groningen, The Netherlands. The Portland Streetcar, Oregon, USA. The ULTra System, Cardiff, Wales. BIBLIOGRAPHY, USEFUL WEBSITES, PHOTO CREDITS.